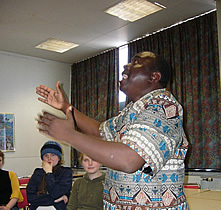 Ezekiel Alembi telling stories to Icelandic high school students. Photos by Terry Gunnell. On 17th January 2010, I received the news that my good friend and Kenyan "brother" Ezekiel Alembi had died of a stroke at his home in Nairobi at the tender age of 49. The news came as a great shock to all of us who had come to know him over the years as a friend and fellow folklorist, not only because of the sudden loss to African folklore studies (and folklore and ethnology in general), but more particularly for Ezekiel's extended family in Nairobi and Bunyore, Kenya, and the countless students of all ages (at home and abroad) who had benefited from his teaching and positive encouragement over the years. The story of Ezekiel's education is an example in itself, and no small achievement. Starting out in 1971 in the local Ziwani primary school in the Vihiga region, in the countryside of Bunyore, in western Kenya, Ezekiel went on to graduate from Ebwirany school in Kakamega, before taking his secondary education in the Kakamega and Kangaru Embu high schools in the same area. His university education in literature and English language then took place in Kenyatta University, Nairobi, where, in 1991, he wrote his MA thesis on local children's songs. Soon after this, Ezekiel began teaching at the same university (in the fields of literature, drama and folklore), and in 1995 became a member of the International Society for Folk Narrative Research, taking a regular and active part in the society's congresses (he became a representative on the ISFNR board in 2008, later going on to serve for more than ten years as the ISFNR Vice-President representing Africa). Participation in these conferences brought him into contact with fellow academics in Europe and America, and especially those from Estonia and Finland where he first took part in one of the Folklore Fellows Summer Schools in Lammi in 1997. This brought him into close contact with Prof. Lauri Harvilahti at the University of Helsinki. Lauri became a close friend and mentor, supervising Ezekiel's Ph.D thesis at the same university, "The Construction of the Abanyole Perceptions on Death through Oral Funeral Poetry" (2002), which dealt with Abanyole death culture in Ezekiel's home area of Bunyore (see http://ethesis.helsinki.fi/julkaisut/hum/kultt/vk/alembi/). Typically, Ezekiel felt it necessary not only to add a summary to the thesis in the local language of the people he was writing about, but also to defend the thesis for a second time orally in front of the local people of Bunyore, an outdoor affair that lasted all day and included not only deep discussions amongst the local people but also music and dance. This, he felt, was the real defence (and the most difficult, even though his listeners proved to be very positive in the end). Ezekiel Alembi's approach to his thesis was reflected in his other articles on folklore, such as "Telling Tales: The Use of Oral Narratives in Religious Sermons in Kenya" (Folklore: Electronic Journal of Folklore, 13  103-110) and "Dawn of a New Era: Song and Dance in Kenya's Multi-Party Elections 2002" (Journal of Indian Folklore, 5,1 ).1 All of these works, dealing with his local Luhya people in his old home district of Bunyore (where he is now buried), show a deep love and respect for his Kenyan culture, along with a firm belief that it deserved equal attention to European and American folklore, and a sense that the new generations of Kenyans should grow up feeling a sense of pride in their local culture and history, rather than a feeling of hopelessness or inferiority in comparison to the European culture they meet daily in the media. This same feeling of pride was reflected in Ezekiel's demands of guests: those of us who visited him should experience Kenya as the Kenyans understood it, rather than from the balcony of a large hotel or a university apartment. It was important that Kenyan culture should be understood from an African viewpoint if it was to be understood more fully. Ezekiel Alembi's respect and hopes for the potential of the young people of his country (who he saw as representing a concrete dream for a better future) were similarly reflected in the over forty five novels and biographies that he wrote for young Kenyan readers, something that earned him not only a literary prize in 2003 but also the respect of his peers in various spheres of life. Most of these books have a deliberately strong moral and educational message showing young people fighting their way past immense difficulties to find safety and achieve new self respect in a changing world, principally if they manage to build on the older values of their culture. Ezekiel was not merely a writer, though: he was also a great storyteller and performer, and many of our conversations at conferences, and during a memorable visit to Kenya in 2007, dealt with the essentially performative nature of storytelling—and the idea that if Africans had drawn up the borders between folklore genres and types of art rather than Europeans, these borders would have been very different (and more multidisciplinary). As anyone could see when watching Ezekiel tell stories, appearance, gesture, expression, tone, rhythm, music and context were as important as the words involved. I have a clear memory of the back half of a conference bus slipping into amazed silence in order to overhear the stories of Kenya he was privately—but loudly—telling me. The same interest in performance and drama could be seen in Ezekiel's tireless work on the annual Kenya Schools and Colleges Drama Festival, for which he served as the National Chairman. These unique festivals, in which hundreds of students of all ages and tribes come together to compete in plays and dance dramas they have put together themselves about subjects that matter to their lives (ranging from AIDS to children's armies, government corruption and genital mutilation), are an experience in themselves. They are also a clear statement of belief in the free speech and increasing mutual respect that recent generations of Kenyan children had achieved after years of dictatorship. For Ezekiel, these children and their art represented a symbol of peaceful hope, as well as a firm belief in the future and potential of his country. It is noteworthy that one of his final achievements was the building and opening of a library designed for local children, set in the garden of the house where he grew up in Bunyore. In spite of his firm local roots, Ezekiel was nonetheless also a man who proved to be infinitely adaptable to changing environments (from the noisy Bunyore market, to the formal Nairobi campus, the snow and ice of Finland and Iceland, and the rooftop heat of central Athens below the Parthenon where I saw him last). 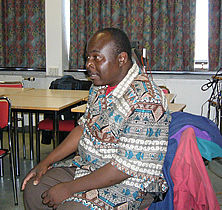 In addition to his work in Kenya (Senior Lecturer in the Literature Department of Kenyatta University from 2003, Chairman of the department between 2007 and 2008, and then Director of Kenyatta University Radio Services until his death), and his memorable appearances at ISFNR conferences, Ezekiel also served on the editorial boards of several American folklore journals (including Cultural Analysis) in addition to being a long-time member of the editorial board of the Estonian journal Folklore: Electric Journal of Folklore. As noted at the start, Ezekiel Alembi will be sorely missed by many. The sound of his deep, rolling laughter at life's small absurdities will nonetheless continue to resound in our memories for years to come: sadly gone, but far from forgotten. Without doubt, his influence will live on in the work of his many students and colleagues.